Additives for Plastics, Volume 2, New Developments contains papers presented at the Symposium on Additives for Plastics, sponsored by the Organic Coatings and Plastics Division, American Chemical Society, and held in Anaheim, California, spring 1978. The volume opens with a chapter on developments in fillers for plastics. This is followed by separate chapters on the principles of micro packing; commercially available glass fillers; the use of precipitated silicas in ethylene-vinyl acetate copolymers to provide a versatile class of materials for many applications; and advancements in plasticizers. 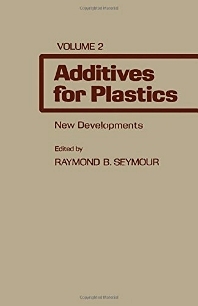 Subsequent chapters deal with the effect of additives on the viscosity of filled resin; the successful application of titanate coupling agents in thermoplastics; electrical, thermal, solvent and anti-fungal properties of organotin-containing poly (ethyleneimine); and additives for stabilizing polymer systems. The final two chapters discuss the ultraviolet stabilization of high-impact polystyrene and the various types of colorants for plastics, respectively.